Clashes between anti-government protesters and troops caused extensive damage to Bangkok. Bangkok, Thailand (CNN) -- Thailand's prime minister said Saturday that the curfew imposed during anti-government protests has been lifted. Emergency law was still in place in 24 of Thailand's 76 provinces, including Bangkok, said Maj. Gen. Prawut Thavornsiri of the police. 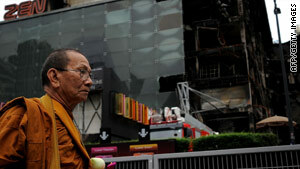 Officials imposed the curfew last week after government troops moved to quell the protests by Red Shirt demonstrators. They extended the curfew this week. Prime Minister Abhisit Vejjajiva said last weekend that "everything is calm and returning to normalcy" following the weeks of protests, which were called off after troops surged in. At least 50 people were killed in clashes between the demonstrators and government troops and nearly 400 people injured, government officials said. Thai investigators claim former Prime Minister Thaksin Shinawatra, who was ousted in a bloodless military coup in 2006, helped mastermind and fund the Red Shirt protests, Thailand's state news agency said this week. Thaksin has denied he was a leader of the Red Shirt demonstrations and said the charges in the arrest warrant shows the government lacks legitimacy.